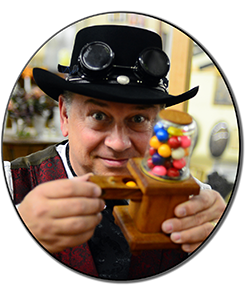 In keeping with his tradition of building a fun-filled show for your young readers, once again comedy magician Doug Anderson is following the 2018 Summer Library Slogan theme of Music and building a Music Magic Show for "Libraries Rock". Your young visitors will yell, laugh and squeal with delight while Doug shares in an entertaining way the difference between "noise" and "music". They will beam with pride as they star in the show's grand finale of your libraries "all children band!" 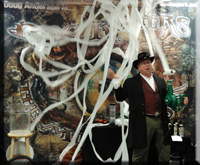 Doug will entertain and entice, mystify and motivate during his 45-minute show filled with special effects and music. In 2018 Doug is bringing back the children favorite Steampunk character "Doc Rogers". From drums to shakers, from diy guitars and frogs, the immersive, interactive style of Doug Anderson as Doc Rogers is guaranteed to be a hit with your kids. You can request Doug by following this link to his online form: We Want Doug! Scenes from 2017: "Build a Better World"
Professional Comedy Magician Doug Anderson brings over 40 years worth of experience entertaining in "real-world" conditions on 5-star cruise ships all over the world, including 5 years as resident magician onboard Premier Cruise Line (formerly the official cruise line of Walt Disney World) and onboard Disney cruises. 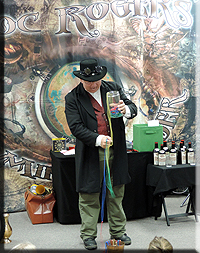 He entertained 30-600 children at a time as well as provided his family-friendly (always!) show for the adults and their kids. Doug will be returning as Doc Rogers: the Mind Bender. 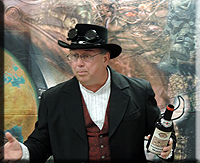 Part-time conjuror, part-time scientist, part-time educator and motivator, full-time Steampunk! Entertaining with mystifying magic, silly fun and poignant reminders of who our heroes really are, and a whole lot more! Doc Rogers' suggested reading bookmarks will have your young readers scrambling to check out books on historical heroes, national heroes, sports heroes and even heroes from your own library hometown! 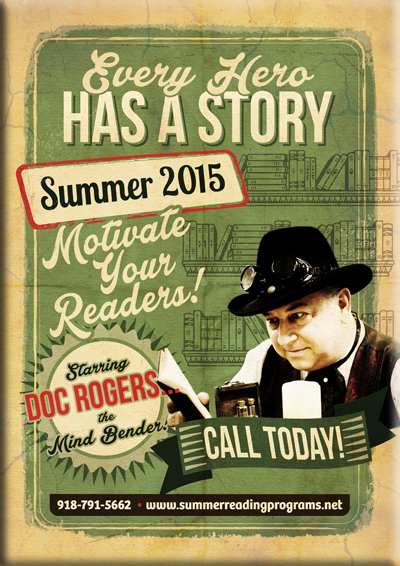 The "Charminator" featured prominently in the 2014 Summer Reading Program "Fizz, Boom... Read!" they had lots and lots of fun participating! Click to play and listen to the squeals of laughter!